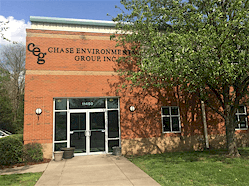 Chase Environmental Group (Chase) was contracted to install pumps and provide system improvements, including software upgrades to an existing groundwater treatment system located at former lighting manufacturing facility. Chase also installed a groundwater collection trench measuring approximately 600 feet in length. The system was designed to facilitate the extraction, treatment and discharge of groundwater from on-site shallow wells. The extracted groundwater is treated by a counter-current, shallow tray, air-stripping unit. The groundwater is contaminated with trichloroethene (TCE) and its degradation products. Modification of the existing system included connecting influent and effluent piping, providing electrical power, and connecting sensor and control wiring to the existing panel. The system is controlled by ISACC (Intelligent System for Automatic Control and Communication). Chase completed an upgrade to this system and installed mechanical and digital flow meters to the influent lines as well as a pressure regulator to control air pressure to the wellhead. Chase completed constructed of a 600-foot long groundwater collection trench. The depth of this trench was between twelve and fifteen feet deep and was excavated into bedrock. 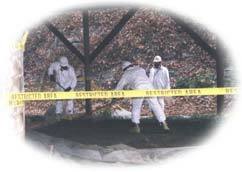 The trench was lined with a 20-mil high density polyethylene (HDPE) sheeting on the bottom and downgradient side of the trench. After the lining was installed, drainage pipe, filter fabric and pea gravel were installed to facilitate drainage towards a sump. A 1,000 gallon HDPE tank was installed in the sump area. A pneumatic twin diaphragm pump was installed in the tank. A high level alarm was installed in the sump and integrated into the ISAAC system which will notify the system in the event of sump pump failure. Approximately 600 tons of soil impacted by the contaminants were disposed of as special waste as part of this project.